On behalf of the management of Qatar Chemical Co. Ltd. (Q Chem) we wish to express our sincere appreciation to M/s. Sharaf Shipping Agency LLC for their excellent service and being a true partner in our business. We would never have been a true supplier of Petro Chemical products throughout the world without the help of SSA. 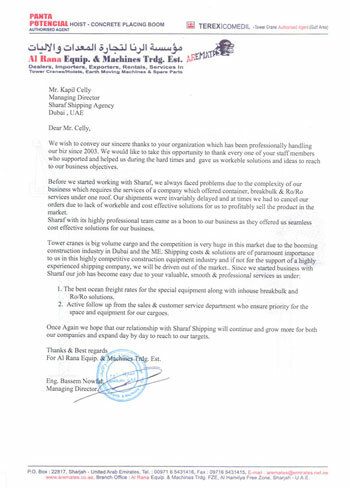 An open statement in favor of Sharaf Shipping Agencies Dubai. Tanker Pacific is a leading provider of marine transportation to the energy markets. The company manages one of the largest fleet of tankers having a total carrying capacity well over 11 million deadweight tons consisting of over 80 vessels spread across a wide range of vessel classes, including VLCC’s, suezmaxes, Panamaxes and product tankers as well as a comprehensive new building program. Tanker Pacific Management (Singapore) Pvt. Ltd. This is to state that we have been associated with Sharaf Shipping Agency for more than 2 years now. Today as the world’s leading house we cannot afford to have second or poor quality support along any stage of our operation. A world class agent in tune with the volatile bulk market scenario only would be able to support us through. This is to state that we have been associated with Sharaf Shipping Agency for over a decade now. All these years we have enjoyed an honest and pleasant relationship. They have an excellent track record till date when it comes to providing ship agency services in Middle East. Their quality of service has been reliable and genuine. On behalf of Amparo Overseas FZE we wish to convey our sincere thanks to Sharaf Shipping Agency LLC which has been handling our business professionally. We would like to thank everyone of your staff members who supported and helped us during the hard times and gave us workable solutions and ideas to reach our business objectives. "We wish to convey our sincere thanks to your organization which has been professionally handling our business since 97'. 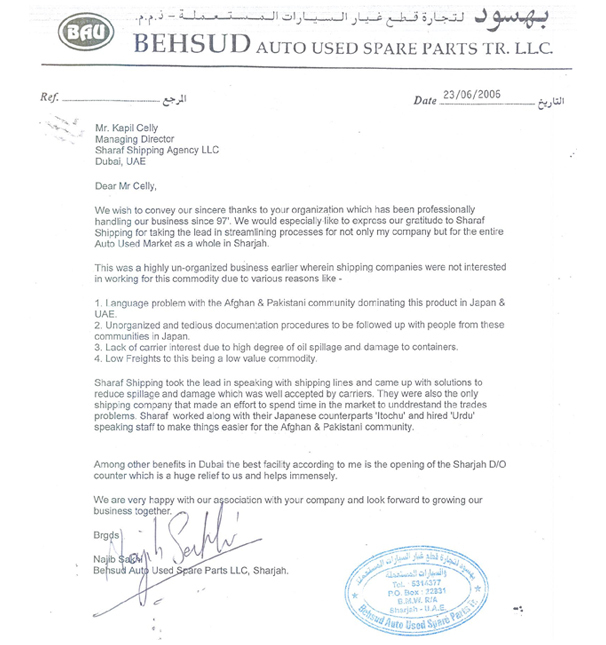 We would especially like to express our gratitude to Sharaf Shipping for talking the lead in streamlining processes for not only my company but for the entire Auto Used Market as a whole in sharjah." "Star Feeders was formed in 1999, talking over existing operations from its predecessor, intergrated Container Feeders Services(ICFS). itself formed in 1981." 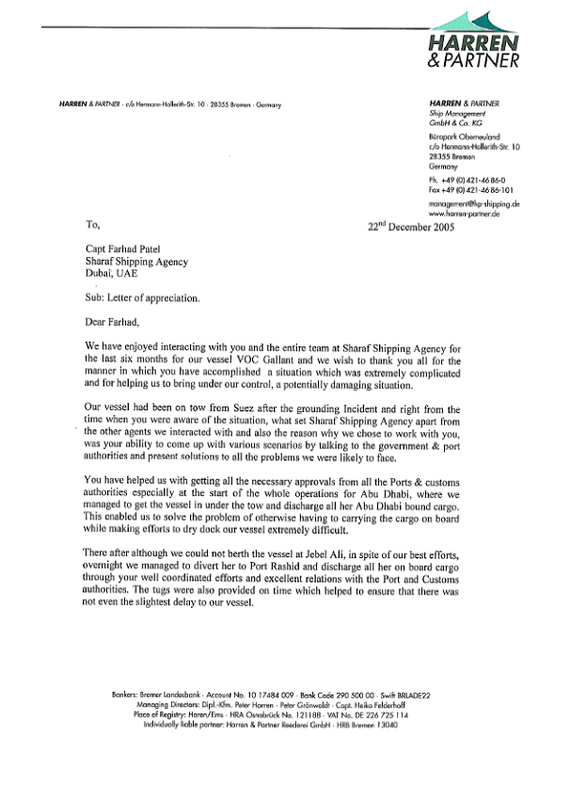 "We have enjoyed interacting with you and the entire team at Sharaf Shipping Agency for the last six months for out vessel VOC Gallant and we wish to thank you all for the manner in which you have accomplished a situation which was extremely complicated and for helping us to bring under our control, a potentially damaging situation." 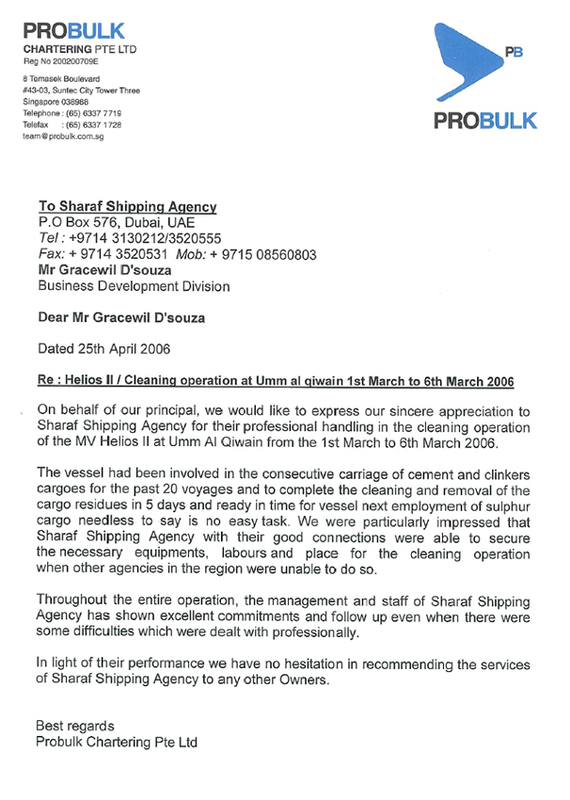 On behalf of our principal, we would like to express our sincere appreciation to Sharaf Shipping Agency for their professional handling in the cleaning operation of the MV Helios II at the Umm Al Qiwain from 1st March to 6th March 2006. The vessel had been involved in the consecutive carriage of cement and clinkers cargoes for the past 20 voyages and to complete the cleaning and removal of the cargo residues in 5 days and ready in time for vessel next employment of sulphur cargo needless to say it is no easy task.